Beijing, the capital of the People’s Republic of China, came into the spotlight when it hosted the Olympic Games in 2008. Although the city has seen a lot of development with glass skyscrapers, five-star hotels and massive shopping malls, Beijing is the political, cultural and educational centre of a country that remains under communist social order. The metropolis was once the seat of the Ming and Qing dynasty emperors until the republic was formed in 1911, so you can expect to see magnificent remnants of China’s imperialist past clashing with socialist-style monuments and buildings. Beijing is the second largest city in China after Shanghai, and is based on a grid of districts with concentric rectangular ring roads that go around it. Highlights include Tiananmen Square, the Forbidden City, and the Temple of Heaven as well as the compulsory attraction for every backpacker, the Great Wall of China. The Forbidden City was the imperial palace during the Ming and Qing dynasties and is the world’s largest palace complex. Built in 1406 to 1420, it was the home of emperors for hundreds of years and now houses the Palace Museum. 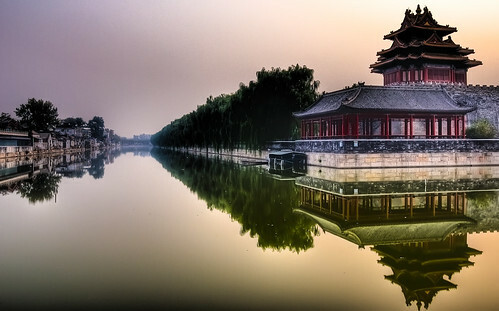 The Summer Palace is the largest imperial garden in China, and was once a summer home for the emperors. Now you can spend the afternoon walking around the parks and gardens. There is a huge lake as well as pavilions, mansions and temples. Tiananmen Square is located in the heart of Beijing and is used for political events, parades, protests and rallies. It is the largest city square in the world and is and iconic symbol of China as it has been the location of many important events in history. Many will remember it for the 1989 protests in which hundreds of civilians were killed when the People’s Liberation Army opened fire. Tiananmen Square is also where Chairman Mao proclaimed the People’s Republic of China. 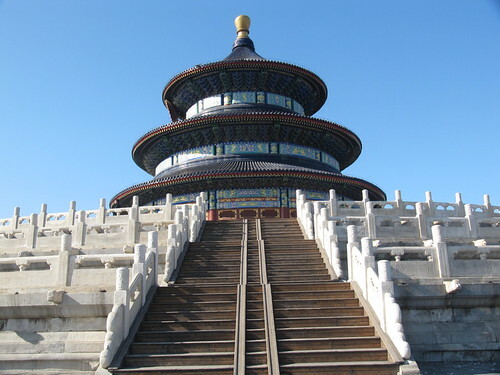 Explore the Temple of Heaven built during the Ming Dynasty to offer sacrifice to Heaven. It is the holiest of Beijing’s temples and was a place for the emperor to pray for a good harvest. If you show up early in the morning you can observe people outside practising tai chi. A fascinating sight to see is the resting place of 13 emperors at the Ming Tombs outside of the city. 13 of 17 Ming dynasty emperors were laid to rest here and two of the tombs are open and have been excavated- Dingling and Changling. The biggest attraction of all is the Great Wall of China, which is around 600km long and was built during the Qin dynasty over 2000 years ago as a line of defence. You can hike the wall at various sections but make sure you take sturdy footwear and water with you. The 2008 Olympics saw the construction of several spectacular structures across Beijing. See the Birds Nest Stadium where Ussain Bolt became the fastest man alive when he set the record for the Men’s 100. While you’re at it, take a look at the National Aquatics Centre, called the ‘Water Cube’, where Michael Phelps became the best Olympian in history. He scooped 8 Gold Medals and shattered 7 world records. Beijing is a chaotic industrial city, with bad pollution, heavy traffic and a huge population. If you’ve heard the Katie Melua song ‘Nine Million Bicycles in Beijing’, you’ll know that the bicycle is rather popular. Bicycles used to outnumber cars, but now the car has taken over and the ring roads are heavily congested. Taxis are rather cheap in Beijing, but the subway is a very convenient way to get around and easy to navigate. Wherever you go, make sure you have a card with the name and address of your hotel written in Chinese. If you’re taking a taxi, ask the receptionist to write your destination in Chinese on a piece of paper which you can then show the taxi driver. Beijing is relatively flat so if you’re a fan of riding around on two-wheels, you can easily rent one from your hotel or accommodation. There are buses, but the subway is usually the first option for tourists. Beijing is a beautiful city, with so much to see. I was lucky enough to spend about 3 months there. The subways are a great way to get around, the food is fantastic and locals mostly friendly. Make sure you visit some of the urban parks to see the locals exercising or just hanging out. My husband has been to Beijing about eight times and has made many comments about the friendliness of the people. Unfortunately he’s also commented on just how horrendous the air quality is too. But one one day he could see the mountains – and exclaimed – what the hell are those. Did you see them??? Brilliant travel tips for Beijing, thanks so much! Every once in a while I see a post that makes me want to jump on a plane and go there at that exact moment – this is one of those posts. For some reason I am not in a hurry to see China but I often find myself daydreaming about exploring it. There is something kind of mystical about it – great post! Hi, I’m accidentally living in Beijing now and this is a great guide. I’d agree that the subway is far preferable to the buses, but it’s really not fun trying to get anywhere on either during the morning rush hours. Beijing is very spread out, so if you’re willing to brave the traffic a little scooter can be the most convenient form of transport. Wonderful post! Never been…I must plan a trip in the near future. Thanks for sharing. Glad you liked the suggestions. All the best with the Mongol Rally. Gosh, that’s certainly going to be an adventure of a lifetime, well, except for that upcoming spaceflight with Sir Richard. 😉 LOL! We were in Beijing last December and want to go back. It was quite cold when we were there and we never made it out to the Olympic Stadium. Hopefully after the Mongol Rally we will get to check it out again. I won’t miss the Temple of Heaven or the Ming Tombs this time around. Thanks for the suggestions. Hahaha! Thanks Serena. I’m sure he’ll ask you soon. 😉 Till then, start planning your bike trip through China. It’ll save you lots of time when you’re planning your wedding!